CONFERENCE: Two days of presentations and discussions on topics related to rights of children. Events are open and free of charge, and are also streamed live. The Bergen Exchanges on Law & Social Transformation is a meeting place for scholars and practitioners who seek to understand how law serves as an instrument of change and how it shapes, and is shaped, by power relations. During a week of public discussions, the strategic use of rights, law and how legal institutions function as arenas for political contestation (lawfare) is examined. 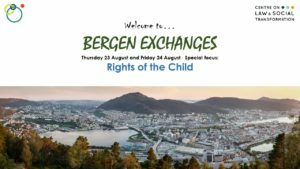 The two last days of Bergen Exchanges 2018 will have a special focus on “Rights of the Child”. Centre for Research on Discretion and Paternalism is co-organizer for the event through our involvement in the Child Right Unit at Centre for Law and Social Transformation. Events are open to the public and free of charge, and no preregistration needed. International Rights and cultural practices? Tarja Pösö, Kenneth Burns, Katre Luhamaa, Staffan Höjer, Conor O’Mahony, Asgeir Falch-Eriksen, Marit Skivenes, Karl Harald Søvig, Helen Stalford, Lara Cortes, Pilar Domingo, Roberto Gargarella, Malcolm Langford, Maja Janmyr, Kirsten Sandberg, Hilde Liden, Sagrario Segado, Hilde Danielsen, Christine M. Jacobsen, Katrin Kriz, June Thoburn, Thomas Meysen, Henriette Sinding, Liv Tønnessen, Bertil Tungodden, Alexander W. Cappellen, Henning Müller, Geir Kjell Andersland (Hordaland County Board), Svanhild Alver (Bergen Child Protection Service), the Pro’s & Marit Sanner (The Change Factory). Most sessions will be held at Bergen Rescource Centre for International Development facilities at Jekteviksbakken 31. The venue is in walking distance from hotels in the city centre.